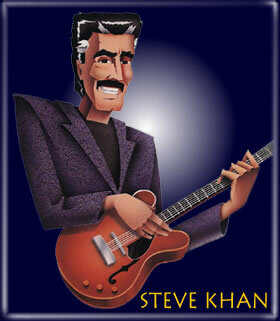 Welcome to the home page of guitarist Steve Khan! Once again, the core group features: Rob Mounsey (Keys & Orchestrations); Rubén Rodríguez (Baby Bass & Elec. Bass), Bobby Allende (Conga), Marc Quiñones (Timbal, Bongo & Perc. ), and the great Dennis Chambers (Drums) returns. The guest artists should be familiar to all those who have followed these albums, and their contributions were immense, they include: Randy Brecker (Flügelhorn); Bob Mintzer (Tenor Sax) and Tatiana Parra (Voice). For the first time, composer and keyboard artist Jorge Estrada appears on his own composition, "Huracán Clare" which is, of course, dedicated to the wondrous Clare Fischer. In all, they perform Steve's arrangements of compositions by: Thelonious Monk, "Epistrophy"; Ornette Coleman, "C. & D." and "T. & T."; Joe Henderson, "A Shade of Jade"; Bobby Hutcherson, "Bouquet"; and Keith Jarrett's "The Journey Home." As always, the recording features a gorgeous ballad: "Too Late Now" written by Alan Jay Lerner and Burton Lane. This time, it appears that there will be a "BONUS TRACK" for downloads only, a spectacular interpretation of Eden Ahbez' "Nature Boy." The music was recorded by James Farber at Sear Sound Studios on March 18th-19th, 2018. Michel Granger's beautiful images grace the cover, and gives this 4th album in the series its own unique look. However, what you now see here is really just a test cover designed by the super-talented Janet Perr. As it is with any recording, there is always a story of just how this all came to be. If you are remotely interested, please go to the NEWS and read further. For those of you who have stayed with Steve for all these years, especially since 2011, please know how very, very grateful he remains for your support and words of encouragement. Thank you all so much!!! NOW AVAILABLE (USA)!!! What a great pleasure it is to announce that it is now official that BGO Records(UK) has now released the reissue of the spectacularly innovative Eyewitness 2 albums "PUBLIC ACCESS-HEADLINE-CROSSINGS"!!! To make this reissue project viable, would there be a way to include all of the music from both "PUBLIC ACCESS"(1989) and "CROSSINGS"(1994) and somehow add in the 3 tunes recorded for "HEADLINE"? After great trial & error, there was one way to do it, and it worked! With the recording of "PUBLIC ACCESS" the Eyewitness approach to music-making continued with original members: Anthony Jackson (Contrabass Guitar) and Manolo Badrena (Percussion & Voice), but this time with Dave Weckl (Drums) alongside Steve on guitar. After a complete break, and the recording of "LET'S CALL THIS"(1991), Steve was asked to record again, with Ron Carter (Ac. Bass) and Al Foster (Drums), but to also do 1/2 of the new album with yet another incarnation of Eyewitness, this time including the great Dennis Chambers (Drums). And so, those 3 wonderful performances from "HEADLINE" are now included in this reissue package. Finally, in 1993, the group gathered together again to record "CROSSINGS" and this time, a special guest artist was added to the mix, and the best and most logical choice was Michael Brecker (Tenor Sax), who appeared on the 3 of the 10 tunes. 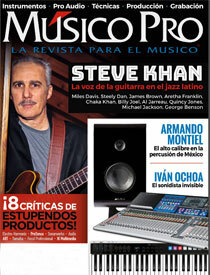 In his new and wonderful liner notes for this package, esteemed Jazz journalist Bill Milkowski wrote the following: "In his most recent outings - 2011's Parting Shot, 2014's Subtext and 2017's Backlog - Khan's blending of Latin rhythms and jazz have come to fruition with timbalero Marc Quiñones, conguero Bobby Allende and bassist Rubén Rodríguez providing the authentic Afro-Cuban grooves to the mix. The seeds for those cross-fertilization experiments were planted on his '70s Columbia albums and nurtured in the early '80s on Eyewitness, Modern Times and Casa Loco. With Public Access, Headline and Crossings, Khan makes the next incremental leap in that continuum. There was nothing like this music and approach to music-making in the '90s - and there is still nothing quite like it." In this spectacular review, Mr. Kelman wrote the following: "If The Eyewitness Trilogy introduced a group whose concept was innovative at the time and remains so today, the essential "PUBLIC ACCESS-HEADLINE-CROSSINGS" takes it more than a few steps further, both in its move from original material to imaginative interpretations, and in acting as a bridge between the guitarist's earlier recordings and later, even more decidedly Latin-oriented albums. NOW AVAILABLE!!! "BACKLOG" will be the title of Steve's new recording, and there is, of course, a subtitle in Spanish, "Asuntos Pendientes." On this album, really the 3rd in a series, Steve expands the potential of the guitar in the context of Latin music, and here, the core group features: Rubén Rodríguez (Baby Bass & Elec. Bass), Bobby Allende (Conga & Bongo), Marc Quiñones (Timbal & Perc. ), and joined for the 1st time by Mark Walker (Drums). A series of old and dear friends, respected colleagues as guest artists added so much to the music, they include: Rob Mounsey(Keys & Orchestrations); Randy Brecker (Trumpet); Mike Mainieri (Vibes); Bob Mintzer (Tenor Sax) and Tatiana Parra (Voice). In all, they perform Steve's arrangements of compositions by: Thelonious Monk, "Criss Cross"; Greg Osby, "Concepticus in C"; Ornette Coleman, "Latin Genetics" and "Invisible"; Bobby Hutcherson, "Head Start" and "Rojo"; and Andrew Hill, "Catta." The recording features two gorgeous ballads: "Our Town" written by Steve's father, Sammy Cahn and Jimmy Van Heusen, and "Emily"(Johnny Mandel-Johnny Mercer). Perhaps the great surprise of the album is the interpretation of Stevie Wonder's "Go Home." Once again, the music was recorded by James Farber at Avatar Studios during January-April, 2016. Michel Granger's beautiful images grace the covers, and gives this 3rd album in the series its own unique look. As a matter of fact, there is a slightly different look for the USA, Japan, and Europe. For several reasons, the releases were staggered! 55 Records(Japan) released the album on September 21st, 2016, and then ESC Records(Germany/Europe) released the album on October 7th, 2016. The U.S. release on Tone Center Records became available across all platforms on February 24th, 2017. If you already have both "PARTING SHOT" and "SUBTEXT" you will not want to miss adding this one to your collection!!! Don't miss Mark F. Turner's terrific REVIEW at AllAboutJazz.com! From the "LATIN JAZZ CORNER" website, we just received news that Chip Boaz had named "BACKLOG" as its "ALBUM OF THE WEEK"!!! We could not be more pleased and grateful for this honor. His review of the album shows that he has a deep understanding of the genre, and what Steve has been trying to do in creating a broader role for the guitar within it. Mil gracias Chip!!! When it was released in Japan, "JAZZ LIFE" magazine wrote this of the album: "Cutting edge Latin jazz album with a completely new approach to wonderful compositions. 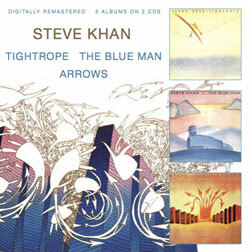 Steve Khan's unique voice creates exciting music no matter what the material might be, or the group with which he plays. That is what makes him so great!" Just prior to the release JAZZ LIFE's Yujin Naito conducted an in depth INTERVIEW with Steve, specifically about the new album, so make some time to read it. NOW AVAILABLE!!! We are so pleased that we can now officially announce that, on April 1st of 2016, BGO Records(UK) officially released the reissue of the groundbreaking albums "EYEWITNESS-MODERN TIMES-CASA LOCO"!!! All 3 albums have been digitally remastered, and now housed on 2 CDs. Originally recorded between 1981-1983, these albums featured the seminal group of: Anthony Jackson (Bass Guitar & Contrabass Guitar), Steve Jordan (Drums) and, Manolo Badrena (Percussion & Voice), alongside Steve on guitar. This is the first time that "MODERN TIMES" has been available on CD outside of Japan. And, of course, as we near the end of the CD Age, this might well be the last time these fantastic recordings will be offered as CDs. NOW AVAILABLE!!! "SUBTEXT" is the title of Steve's most recent recording, and again, there is a subtitle in Spanish, "Subtexto en Azul." On the album, Steve continues his explorations of the wondrous traditions of Latin music, and this time, the core group features: Rubén Rodríguez (El. Bass & Baby Bass), Bobby Allende (Conga), Marc Quiñones (Timbal), and Dennis Chambers (Drums). At varying moments, they are joined by some great musicians, dear friends, as guest artists, including: Rob Mounsey (Keys & Orchestrations); Randy Brecker (Flügelhorn); Gil Goldstein (Accordion); and Mariana Ingold (Vocals). In all, they perform Steve's arrangements of compositions by: Ornette Coleman, "Bird Food"; Freddie Hubbard, "Baraka Sasa"; Wayne Shorter, "Infant Eyes"; Greg Osby, "Heard"; Thelonious Monk, "Hackensack"; and the gorgeous ballad, "Never Let Me Go"(Livingston-Evans). All this, plus 2 originals from Steve, and, a Cumbia driven Vallenato epic collaboration between Steve and Mariana Ingold. Once again, the music was recorded by James Farber at Avatar Studios during January 29th-30th, 2014. Michel Granger's beautiful image graces the cover, and contributes its own particular "subtext." Again, 55 Records(Japan); ESC Records(Germany/Europe) and Tone Center Records(USA) formed this important part of the team. 55 Records released the album on May 21st, and ESC Records released it on May 30th. The U.S. release just happened on June 24th, 2014. If you enjoyed "PARTING SHOT," you will surely love this new one!!! As 2014 came to a close, John Kelman selected "SUBTEXT" as one of the BEST RELEASES OF 2014. Obviously, this was a great honor to placed in such excellent company!!! A note from the Webmaster: Check out KHAN'S KORNER 1 which now has 107 hand-written solo transcriptions. Classic solos by: Miles Davis, Jim Hall, Grant Green, Wes Montgomery, Freddie Hubbard, Michael Brecker, Stanley Turrentine, Herbie Hancock, Clare Fischer, Chick Corea, Pat Martino, Kenny Burrell, Paul Desmond, George Benson, George Coleman, Steve Grossman, John Scofield, Gabor Szabo and Robben Ford, plus corresponding mp3s. After a little summer break, we return in August and bring you a very special treat. a Jim Hall solo over his own composition, "Careful," which was originally recorded for Gary Burton's early album, "SOMETHING'S COMING"(RCA) in 1963. The reason the tune was given this title is because it's a 16-bar blues and you always have to remember that the IV7 chord, in this case D7, has two extra bars!!! So, be careful!!! In addition to the solo, I decided to present the lead sheet for the tune as it appeared on that early and then, I also decided to give you a look at how Jim performed the very same tune some 4 years later in 1967 during a live performance recorded and released as the BERLIN FESTIVAL - GUITAR WORKSHOP(Saba) where he was accompanied by Steve Swallow and Bob Moses. It's fascinating to hear how this melody morphed, grew, and changed with the passage of time. This is a great opportunity, so take advantage of it!!! As June arrives, one last time, we are sticking to CROSSINGS(Verve) from 1994, from the just released BGO Records(UK) reissue of PUBLIC ACCESS-HEADLINE-CROSSINGS remastered, and packaged together on 2 CDs, and this becomes the last in a series of Michael Brecker solos. Performed over the Branislau Kaper-Gus Kahn obscure standard, "While My Lady Sleeps," here performed in 3/4, though it is still really an Afro-Cuban 6/8 feeling, Michael's solo is a masterpiece of melodic continuity, fire and development. All the propulsion necessary comes from this Eyewitness2 grouping that featured: Anthony Jackson(contrabass guitar), Manolo Badrena(percussion) and Dennis Chambers(drums). It seems that this particular performance has been enjoying a bit of a renaissance at Jazz radio, even after 25 years. Listeners are finding it to be as relevant today as it was ahead of its time back then. So, rejoice in all that is glorious about Michael Brecker, and enjoy this solo to the fullest with our best wishes! It is finally May, and we are not only staying with CROSSINGS(Verve) from 1994, from the just released BGO Records(UK) reissue of PUBLIC ACCESS-HEADLINE-CROSSINGS remastered, and packaged together on 2 CDs, but we are now presenting the Michael Brecker solo from that same performance of "Descarga Khanalonious." While playing over a single Eb7(9) sonority Mike explores the full ranges of his tenor sax and interacts intuitively with this Eyewitness2 grouping that featured: Anthony Jackson(contrabass guitar), Manolo Badrena(percussion) and Dennis Chambers(drums). In Steve's analysis, some of the key moments of harmonic and linear brilliance are pointed out as Mike and Anthony dance around one another. All the while, Dennis and Manolo offer commentary that is at once unique to both of them but timely in that moment. This is one of the true highlights of the entire album. Don't miss this great opportunity to listen and to learn. For April, we are bringing you this Steve Khan's "Descarga Khanalonious" solo, that originally appeared on CROSSINGS(Verve) in 1994, and it arrives with the just released BGO Records(UK) reissue of PUBLIC ACCESS-HEADLINE-CROSSINGS remastered, and packaged together on 2 CDs. This 64-bar solo features all the superb interplay from this Eyewitness2 grouping that featured: Anthony Jackson(contrabass guitar), Manolo Badrena(percussion) and Dennis Chambers(drums), with a most special appearance by Michael Brecker(tenor sax). It is in the end a masterpiece of the superb conversational style that this group helped to create. It is hard to believe that this all took place nearly 25 years ago but feels just as timely and vibrant today in 2018. As John Kelman wrote in his recent review: "Eyewitness is often lauded for its unique (especially for its time) language and approach, deeply felt grooves and stellar playing. Still, the group's telepathic ability to engage with one another on a profound level must not be overlooked. Its intrinsic conversational ability, a definitive one." For me, just surviving this February was something to feel good about! 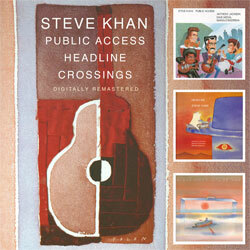 With that said, March of 2018 continues with a celebration of the BGO Records(UK) reissue of "PUBLIC ACCESS"-"HEADLINE"-"CROSSINGS" remastered, and packaged together on 2 CDs, and we are offering Steve Khan's solo, that originally appeared on CROSSINGS(Verve) in 1994. This 4-chorus solo was performed on Thelonious Monk's classic composition, "Think of One" and receives one of Steve's early Latin-influenced treatments driven by the interactive brilliance of Anthony Jackson (contrabass guitar), Dennis Chambers (drums) and Manolo Badrena (percussion). As Bill Milkowski put it in his liner notes: "Hearing these records again reminds one of just how radically fresh and experimental they were when they came out 25 years ago. There was no template for this sound back then. The spaciousness and misterioso vibe, the brilliant use of counterpoint between guitar and bass, the bizarro midi percussion floating in and out of the mix, all while still being grounded by an insinuating Latin undercurrent …it was unprecedented for the '90s.....and there is still nothing quite like it!" Hoping that everyone had a very, HAPPY NEW YEAR!!! Y, por supuesto, les deseamos un FELIZ AÑO NUEVO!!! With that said, 2018 begins with another wondrous Michael Brecker solo on the title track from acoustic bassist Eddie Gómez' album, "POWER PLAY"(Columbia) that dates back to 1988. The tune also featured co-composer LeeAnn Ledgerwood(keyboards) and, for the 1st time only on this song, drummers Steve Gadd and Al Foster playing together. Mike's solo begins with thematic units to develop and along that journey, he explores the full range of his saxophone, a remarkable four octaves. This 40 bar solo over a funk-oriented 16th-note groove with two modal m7(9sus) chords is sure to become a favorite with those who visit these pages. We are hoping that everyone had a very cozy & warm HAPPY THANKSGIVING!!! As it turns out, there is to be one last Steve Khan solo to be presented from "BACKLOG"(Tone Center) over saxophonist Greg Osby's brilliant composition "Concepticus in C.". Steve is once again supported by the spectacular keyboard work of Rob Mounsey alongside the very funky cha-cha-cha rhythms of Marc Quiñones(timbal & güiro), Bobby Allende(conga), Rubén Rodríguez(baby bass) and drummer Mark Walker's serious fatback groove. While negotiating the complex harmonies, Steve's solo is rooted in the blues language. Without question, one of the best tunes on the album! We close by wishing everyone a very happy HOLIDAY SEASON for 2018!!! We are hoping that everyone had a safe and very HAPPY HALLOWEEN! Hard to believe, but we have arrived at November, and we are privileged to present another fantastic Wes Montgomery solo from his recent reissue "DANGEROUS"(Milestone). Finally, we have a recorded version of Wes soloing over the great standard, "Stella by Starlight." On this 1961 recording, Wes is accompanied by brothers Buddy Montgomery(vibes) and Monk Montgomery(ac. bass), and it is all driven by the drumming of Paul Humphrey. We are certain that you will enjoy Wes' 6-chorus solo, played in the key of Eb major, rather than the more familiar key, at least to most, of Bb major. Don't miss out on this one! We close by wishing everyone a very, very early, HAPPY THANKSGIVING!!! For the month of October, we offered a 2nd Michael Brecker solo from keyboardist Neil Larsen's 1979 album, "HIGH GEAR"(Horizon), and it is on another Larsen original, "Demonette." Once again, Buzz Feiten(Guitar) joins Abraham Laboriel(El. Bass); Steve Gadd(Drums); Paulinho Da Costa(Perc.) on this double-time Samba/Fusion-oriented track. Michael's solo here is really more about being right in the center of the flow of the time feel, and swingin' really hard! To these ears, there is not a single note in this solo that ventures outside the harmonies, not one! How rare is that for a Michael Brecker solo? There is hardly any chromaticism within the solo. How rare is that? It proves one thing at the very least, if you play with aggressive and swinging time, you can play anything, and it's going to work - and, more than this, you can play completely inside, and have a monster of a solo! See if you don't feel the same way. From the heat of another August in New York, "Emily," the forever beautiful Johnny Mandel and Johnny Mercer song, became an experiment within the cross-rhythms of the Afro-Cuban 6/8 feeling, but this time inventively presented as a ballad. This Steve Khan solo transcription, from the recently released BACKLOG(Tone Center) album, becomes the seventh and final one in the series. What Rob Mounsey added with his arranging and orchestrational talents to Steve's original arrangement became one of the album's true highlights. Rubén Rodríguez(Baby Bass); Marc Quiñones(Timbal); and Bobby Allende(Conga) stay in the 6/8 zone, while Mark Walker(Drums) and Steve float above it all offering more of a 4/4 feeling against the prevailing rhythms. See if it feels like that for you. Steve's solo is truly one of his most melodic and lyrical, a tribute to both Paul Desmond and Jim Hall. When we hit this past 4th of July weekend, Ornette Coleman's "Invisible" became the the 6th in our series of Steve Khan solo transcriptions from his most recent album, BACKLOG(Tone Center). The performance features the beautiful sound of Bob Mintzer's tenor sax, which adds so much to the melody statement, not to mention his own spectacular solo. Steve's own wonderful solo picks-up where Bob left off, and explores open linear ideas mixed with some very creative Latin elements on guitar. Once again, in the analysis, a link is provided for those interested in seeing the keyboard parts written for Rob Mounsey. In addition to his big tumbao, and great ensemble playing, Bobby Allende(Conga) contributes a tremendous solo as well. Not to be missed! 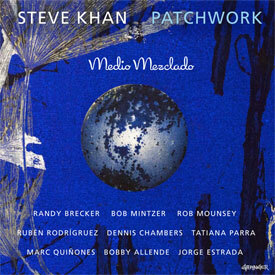 As June arrives, bringing with it hints of the summer season, we offer the fifth in our series of Steve Khan solo transcriptions from his BACKLOG(Tone Center) album. This steel-string acoustic guitar feature was played over "Rojo," the 2nd Bobby Hutcherson tune that originally appeared on his 1966 album, HAPPENINGS(Blue Note). The spectacular comping of Herbie Hancock on the original version played a huge role in the construction of the keyboard arrangement, played so beautifully by Rob Mounsey. Herbie colored most of the melody notes in the [A] sections with very creative clusters, and Steve's arrangement sought to expand on this idea. The performance also features a great timbal solo from Marc Quiñones, and Mark Walker's drum solo over the final montuno is truly one of the album's shining moments. May 3rd arrived, and Spring finally wasn't too far behind. This rather obscure Frank Sinatra song, written by Steve's father, Sammy Cahn and Jimmy Van Heusen in 1955 for the NBC musical production of Thornton Wilder's play, the title song, "Our Town" becomes the fourth in the series of Steve Khan solo transcriptions from the recently released BACKLOG(Tone Center) album. The hypnotic Afro-bolero feeling is enhanced immensely by the gorgeous orchestral arrangement by the great Rob Mounsey. The transcription not only includes the body of the solo section, but offers what Steve improvised over the Fade as well. The analysis provides some fascinating family insights, as well as a deeper look inside the performance and all its aspects. Not to be missed! How quickly April 3rd is upon us, and we are now bringing you the 3rd in the series of Steve Khan solos from the just released BACKLOG(Tone Center) CD. Our feature becomes Bobby Hutcherson's composition "Head Start" from his 1966 album, "HAPPENINGS." Steve's 3-chorus solo follows a fantastic vibes solo from Mike Mainieri and offers an unfolding musical journey of interesting lines counter-balanced by wildly creative montunos. As it happens, the sounds of Steve's Zawinul-esque DVP-1 harmonized lines appear for the 2nd time on the recording. As always, Steve's analysis attempts to demystify all the lingering questions associated with the overall performance, which did take some surprising rhythmic turns considering that Steve's demo was done completely with a songo feel. March 15th saw us present the 2nd in a series of Steve Khan solos from the just released BACKLOG(Tone Center) CD. Ornette Coleman's 1987 composition, "Latin Genetics" is given the rhythmic backdrop of a Puerto Rican plena. This festive rhythm gave rise to a brilliant solo from trumpeter Randy Brecker, and Steve's solo follows informed by Randy's, and then going off on its own path. It puts to use, for the 1st time, on this album, the sounds of Steve's Zawinul-esque DVP-1 harmonized lines. The analysis is filled with interesting stories and perceptions. There was even enough space to present the wonderful soli section, which is actually drawn from the re-imagined fragments of Ornette's original solo. Don't fail to take advantage of this one!!! On, March 1st, 2017, we begin to present a series of Steve Khan solos from the just released BACKLOG(Tone Center) CD. Thelonious Monk's "Criss Cross" becomes the 1st presentation. Steve's solo features all the classic elements that one has come to expect from his playing: the angular lines, the crisp and incisive chordal punctuations, and his outside-the-box montunos. The performance is the most pared down setting with: Rubén Rodríguez(Baby Bass); Marc Quiñones(Timbal); Bobby Allende(Conga); and Mark Walker(Drums). Don't miss Steve's analysis of what was played, and how the arrangement came into being. More to come in two weeks time!!! We now close out 2016 with a special little holiday treat as we bring solos by both Paul Desmond and Jim Hall over the traditional "Greensleeves" which was recorded in 1959 on Desmond's EAST OF THE SUN(Discovery) album. Though the actual performance is only 2:05 in length, these two masters of melodic improvising provide us with a path to maintain those often under appreciated gifts. Here's wishing everyone a very happy HOLIDAY SEASON for 2016!!! Firstly, we are hoping that almost everyone had a safe and very HAPPY HALLOWEEN, 2016!!! Yes, we're back and it is now November, 2016, and we present this great Grant Green solo that appears on a track that was actually recorded in 1962, and yet, the album sat on the shelf for some 7 years, and finally, GOIN' WEST(Blue Note), was released in 1969. Here Green is accompanied by the great Herbie Hancock, alongside Reggie Workman, and drummer Billy Higgins as they interpreted some classic songs from the world of Country & Western music. "Red River Valley" comes from our great "Western" traditions. Hoping that everyone will take advantage of this opportunity to investigate the charm, the swing, the bluesiness of Grant Green. We close by wishing everyone a very, very early, HAPPY THANKSGIVING!!! Now, for November, 2015, we returned for a brief visit, and a special presentation of a great Stanley Turrentine solo over the George & Ira Gershwin standard, "They Can't Take That Away From Me." Not offered on the original LP release, it appears on Stanley's 1963 album for Blue Note, NEVER LET ME GO, and features a very swingin' rhythm section of: Shirley Scott(organ); Sam Jones(Ac. Bass); and Clarence Johnston(drums). This solo is filled with all the elements that made "Mr. T." such a vibrant voice, one that bridged the gap between Soul Jazz and Traditional Jazz. Don't miss Steve's wonderful analysis. During August, we returned and offered a unique look at the comping style of the great Kenny Burrell. His performance, fundamentally playing behind Clark Terry on the transformed interpretation of the Mexican folkloric classic, "Cielito Lindo," is a joy to hear from start to finish. It appeared on drummer Ed Thigpen's 1966 album for Verve, OUT OF THE STORM, which also featured the characteristic brilliance of both Herbie Hancock and Ron Carter. Transformed from the traditional 3/4 rhythms to a spirited Latin-influenced, or Brazilian-influenced cut-time feel, the group's performance is filled with gems throughout. Take advantage of Steve's informative and insightful analysis. To honor his birthday, March 29th, all through April we will celebrate Michael Brecker by presenting a solo on one of Steve Khan's early tunes, "The Hobgoblin Stomp" that only appears on a rather crude sounding 1972 demo by the group Future Shock. That group also included: Randy Brecker; Don Grolnick, John Miller and Bruce Ditmas. This demo recording was post-Dreams, and two fantastic Hal Galper albums, and offers a wonderful view into a tenor saxophone style that was destined to influence players the world over. In the text of Steve's analysis, there is also a link to an incredible soprano sax solo of Mike's from another tune on the demo. Don't leave the page without locating it and listening! February brings a wonderful Chick Corea acoustic piano solo, that appeared on fellow Return to Forever member Airto's 1972 album for CTI, FREE. This joyous song was composed by Brazilian saxophonist Victor Assis Brasil, and on board for this performance were: Joe Farrell, Ron Carter, and Nelson Ayres. This solo embodies Chick's harmonic and rhythmic concepts pre and post his stint with Miles Davis. This is a great one, don't miss it!!! For January, 2015, we began the new year by celebrating the life and music of saxophonist Michael Brecker and his wondrous 3-chorus solo over the Larry Goldings penned composition, "Sound Off" from Mike's 1999 album, TIME IS OF THE ESSENCE(Verve). Supported by Goldings(organ), Pat Metheny(guitar), and Jeff "Tain" Watts(drums), the performance swings relentlessly. And so, in that spirit, we wished everyone a very, HAPPY NEW YEAR!!! Y, por supuesto, les deseamos un FELIZ AÑO NUEVO!!! During 2014, we presented a collection of Steve's solos from SUBTEXT(Tone Center) that included: "Cada Gota de Mar"(December); "Bird Food"(November); "Blue Subtext"(October); "Never Let Me Go. "(September); "Hackensack"(August); and "Bait and Switch"(July). 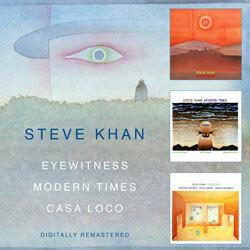 At KHAN'S KORNER 2, as it is now April and we are desperately trying to shed winter and head into springtime of 2016, we present to you Steve Leonard's classic surfing tune, "Penetration" which originally appeared on the "CASA LOCO" LP/CD in 1983, and now appears on the fantastic BGO Records(UK) reissue of all 3 original Eyewitness albums. Don't miss all of Steve Khan's wonderful anecdotes and some special surprise treats!!! The music created by Anthony Jackson; Steve Jordan; Manolo Badrena; and Steve Khan remains a treasure to the original fans of the group, and now, to a new generation as well. Around the HOLIDAY SEASON of 2015, we are brought you, one of Steve's older compositions, that dates back to 1978 and saxophonist Mark Colby's 1st album, SERPENTINE FIRE(Tappan Zee/Columbia). The recorded performance featured: Bob James; Gary King; Steve Gadd; and Rubens Bassini. Steve's analysis tells the story of how this all came to be, including the title, which was inspired by Jean-Michel Folon's beautiful watercolor poster for Amnesty International. As July and summer arrived on the east coast, we acknowledged the heat and humidity, by offering one of Steve's earliest Latin compositions from his 1st album in 1977 as a leader, "TIGHTROPE"(Antilles). "Where Shadows Meet," written now in 6/8, featured some fantastic playing from Don Grolnick; Will Lee; Steve Gadd and Ralph MacDonald, with wonderful synth orchestrations by Bob James. Hoping that all our visitors enjoyed this presentation. For June, we presented a newly revised lead sheet for "Auxiliary Police," one of the signature tunes from the 1981 "EYEWITNESS"(Antilles) recording. This was our first experiment at a group composed, improvised piece of music. In a way, it was born of a double hi-hat that Steve Jordan had designed for him, and was debuting it, in stereo, on that recording. Though the design was primitive, the effect was really great. The piece also featured the brilliant subterranean harmonic explorations of Anthony Jackson, and the super-inventive World percussion imagined by Manolo Badrena. While visiting the studio on the day that we recorded this piece, bassist Will Lee chimed-in with its title. During May, we offered "The Breakaway," an improvised and group-composed piece from "CASA LOCO." Recorded in 1983, it featured the innovations of Steve Jordan's hybrid drum kit, integrating Simmons electronic drums, and Manolo Badrena's hybrid percussion set-up that then featured the wild sounds created by Syn-cussion. Sprinkle in Anthony Jackson's inventive bass playing on his trusty old Fender 4-string, and we ended-up with a completely zany piece of music. What kind of music is this? Perhaps, you will draw your own conclusion? Steve's analysis is an insightful investigation of the group, and its process in attempting to improvise such things. For March of 2015, in celebration of the BGO Records(UK) reissue of Steve's 3 Columbia albums from 1977-79, we presented the lead sheet for Randy Brecker's wonderful tune "The Big Ones" which appeared on "TIGHTROPE"(1977) and featured a stellar line-up of musicians that included: the Brecker Bros., David Sanborn, Don Grolnick, Bob James, Will Lee, Steve Gadd, and Ralph MacDonald. This is actually the first time that all three LPs will appear in the digital realm, though as an import, in the United States, Europe, and South America. This might be the only opportunity to have these albums as CDs. With the arrival of autumn, October, 2014 is here and we're happy to share "Blue Subtext," the 2nd of Steve's original from "SUBTEXT." The tune began as an experimental play-along tribute to the lush and romantic keyboard harmonies of Clare Fischer. On the recording, that role was filled with love and care by the great Rob Mounsey. The changes to the tune are based upon a well-known Jazz standard, and serves as a great vehicle for Steve's playing. Quite out of nowhere, echoes of his guitar hero Wes Montgomery popped-up in couple of places. "Bait and Switch" was the first tune posted from "SUBTEXT," composed as a tribute, in part, to the late, great Joe Zawinul, with whom Steve shared many stages and many miles of travel, conversations, and gin rummy, during the summer of 1986. Judging by the feedback, everyone seemed to enjoy reading about just how this tune was put together!!! We celebrated of the simultaneous recent uploads to iTunes of Steve's catalog albums from the past, we are pleased to offer the last remaining composition, the title song from the "MODERN TIMES"(1982) album. This live album was the 2nd of three recordings with the original Eyewitness configuration that featured: Anthony Jackson, Steve Jordan, and Manolo Badrena. If you are or were a fan of that group, don't miss this special presentation of a newly revised lead sheet. Here's hoping that this never-ending winter of our discontent is almost finished!!! When we arrived at September of 2013, it has been almost one full year since any was presented here. It was a most interesting cosmic accident when someone happened to send me a YouTube link for "Macbeth," which was a song that I had contributed to Mark Colby's 1979 LP, "ONE GOOD TURN." The recorded performance featured: Bob James, Gordon Johnson, Steve Gadd, and Portinho. Honestly, I hadn't heard it in years, perhaps two decades at the very least, but, as I have tried to share the lead sheets for all the original tunes, I was inspired to rewrite the lead sheets. And so, here they are, and they come to you with the hope that you will enjoy reading the analysis and the story of this particular composition. In December of 2012, we presented the lead sheets for Steve's composition, "Rites of Darkness" which now appears on Volume 2 of the just released compilation, "MONTREUX SUMMIT" by the CBS Jazz All-Stars. Recorded live at the Montreux Jazz Festival in 1977, this performance featured Steve alongside: George Duke; Bob James; Alphonso Johnson; Billy Cobham; and Ralph MacDonald. Though the performance has many flaws, on the odd chance that a new generation of players might find the tune interesting enough to try to play and perform made this presentation seem like a reasonably good idea. Steve's analysis offers insights into everything that happened leading up to the performance and the aftermath as well. This site created and maintained by Blaine Fallis, A Train Creative, Inc. . Graphic design Blaine and Youngsuk Fallis. Written and edited by Steve Khan. Steve Khan illustration by NED SHAW. Don't miss Ned's latest at our ONLINE GALLERY!